Sauk County’s Don Meyer has received the highest award Wisconsin Farm Bureau Federation bestows upon its members. Meyer was presented the Wisconsin Farm Bureau Federation’s ‘Distinguished Service to Farm Bureau’ award during the organization’s 99th Annual Meeting in Wisconsin Dells on December 2. “It is because of his selfless dedication to others and agriculture that I am extremely proud to recognize Don’s distinguished service to Farm Bureau,” said WFBF President Jim Holte. Meyer has been an active member of Farm Bureau since 2000 and served in key leadership roles. Meyer was instrumental in starting a Sauk County Farm Bureau Ag in the Classroom program by reaching out to teachers in Sauk County with their Taste of Sauk County event. He built the Sauk County Farm Bureau Ag in the Classroom program from the ground up to 15 active Ag in the Classroom volunteers. When he started, there was one essay submitted for the essay contest. After five years of building relationships with Sauk County teachers, there were 261 applicants. During his tenure as the Ag in the Classroom coordinator, Meyer had three educators recognized with the Outstanding Teacher Awards. In 2014, Meyer helped the county’s Ag in the Classroom win the Wisconsin Farm Bureau County Activities of Excellence Award for Ag Promotion and Education. 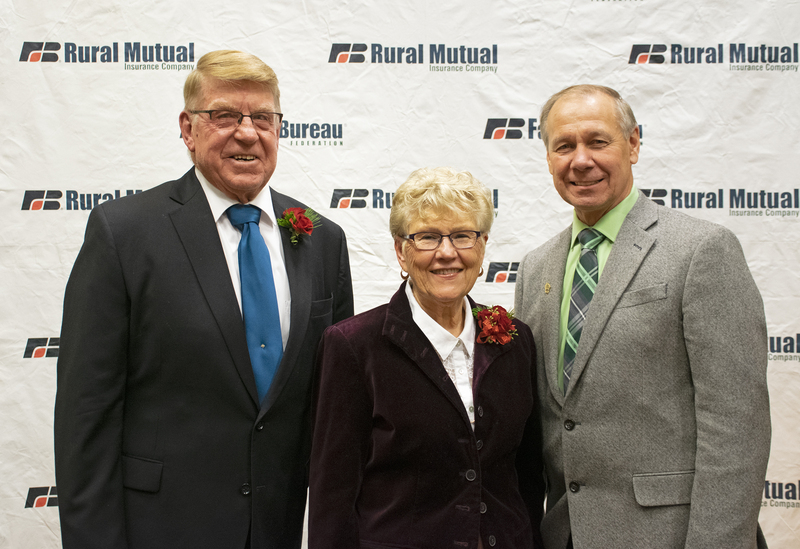 Throughout the years, Meyer has served on the Sauk County Farm Bureau board as vice president, secretary and treasurer. He attended many Ag Day at the Capitol events and serves on the county’s policy development committee. He also is a Wisconsin Farm Bureau Leadership Institute Class IV graduate. Don has always been actively involved in the agriculture community. In addition to his involvement in Farm Bureau, he served as a past state FFA officer and on the Tristate Board. He raised and sold registered Holsteins, which led to his involvement in the Sauk County Holstein Association and Wisconsin Holstein Association. In 2017, Don and his wife Beverly were recognized as king and queen of the Reedsburg Butter Festival.